I'm currently affiliated with the National Center for Atmospheric Research (NCAR) in Boulder, CO as a Project Scientist. At NCAR, I work within the data assimilation group in the Mesoscale and Microscale Meteorology (MMM) Laboratory. Research Interests: Improving forecasts of extreme, high-impact weather, such as severe convection and its associated hazards (tornadoes, high winds, large hail). To do so, I primarily utilize novel data assimilation techniques and ensemble forecasting methods. Much of my research involves improving predictions of convective weather and its hazards. These events are often challenging to predict given their small size and short lifetimes compared to larger-scale atmospheric phenomena, but routinely have substantial impacts on life and property. My interest in predictions span many time-scales, from short forecast lead-times to assist in improving warnings, to longer lead-times to improve predictions of storms occurring hours or days into the future. I frequently use tools such as ensemble data assimilation and high-resolution numerical weather prediction models that explicitly resolve convection. Ensemble systems are essential given the many uncertainties that exist with forecasting convective storms. I'm also interesting in using ensemble systems to improve predictions of other high-impact weather phenomena, as well as ways to derive forecast guidance that incorporates uncertainty information from ensembles to improve decision-making. 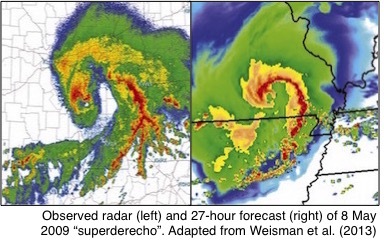 Sobash, R. A., C. S. Schwartz, M. L. Weisman, and G. S. Romine, 2019: Next-day prediction of tornadoes using convection-allowing models with 1-km grid spacing. Wea. Forecasting, submitted. 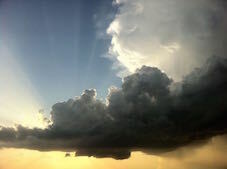 Schwartz, C. S., G. S. Romine, R. A. Sobash, K. R. Fossell, and M. L. Weisman, 2019: NCAR’s real-time convection-allowing ensemble project. Bull. of Amer. Meteor. Soc., in press. Clark, A. J., and Coauthors, 2018: The Community Leveraged Unified Ensemble (CLUE) in the 2016 NOAA/Hazardous Weather Testbed Spring Forecasting Experiment. Bull. of Amer. Meteor. Soc., 99, 1433–1448. Sobash, R. A. and J. S. Kain, 2017: Seasonal variations in severe weather forecast skill in an experimental convection-allowing model. Wea. Forecasting, 32, 1885–1902. Gagne, D. J., A. McGovern, S. E. Haupt, R. A. Sobash, J. K. Williams, and M. Xue, 2017: Storm-Based Probabilistic Hail Forecasting with Machine Learning Applied to Convection-Allowing Ensembles. Wea. Forecasting, 32, 1819–1840. Schwartz, C. S. and G. S. Romine, K. R. Fossell, R. A. Sobash, and M. L. Weisman, 2017: Toward 1-km ensemble forecasts over large domains. Mon. Wea. Rev., 145, 2943–2969. Trier, S. B., J. W. Wilson, D. A. Ahijevych, R. A. Sobash, 2017: Mesoscale Vertical Motions near Nocturnal Convection Initiation in PECAN. Mon. Wea. Rev., 145, 2919–2941. Poterjoy, J., R. A. Sobash, and J. L. Anderson, 2017: Convective-scale data assimilation for the Weather Research and Forecasting model using the local particle filter. Mon. Wea. Rev., 145, 1897–1918. Sobash, R. A., G. S. Romine, C. S. Schwartz, D. J. Gagne, and M. L. Weisman, 2016: Explicit forecasts of low-level rotation from convection-allowing models for next-day tornado prediction. Wea. Forecasting, 31, 1591-1614. Sobash, R. A., C. S. Schwartz, G. S. Romine, K. R. Fossell, and M. L. Weisman, 2016: Severe weather prediction using storm surrogates from an ensemble forecasting system. Wea. Forecasting, 31, 255-271. Schwartz, C. S., G. S. Romine, R. A. Sobash, K. R. Fossell, and M. L. Weisman, 2015: NCAR's experimental real-time convection-allowing ensemble prediction system. Wea. Forecasting, 30, 1645-1654. Schwartz, C. S., G. S. Romine, M. L. Weisman, R. A. Sobash, K. R. Fossell, K. W. Manning, and S. B. Trier, 2015: A real-time convection-allowing ensemble prediction system initialized by mesoscale ensemble Kalman filter analyses. Wea. Forecasting, 30, 1158–1181. Sobash, R. A. and L. J. Wicker, 2015: On the impact of additive noise in storm-scale EnKF experiments, Mon. Wea. Rev., 143, 3067-3086. Weisman, M. L. and Coauthors, 2015: The Mesoscale Predictability Experiment (MPEX), Bull. of Amer. Meteor. Soc., 96, 2127–2149. Sobash, R. A. and D. J. Stensrud, 2015: Assimilating surface mesonet observations with the EnKF to improve ensemble forecasts of convection initiation, Mon. Wea. Rev., 143, 3700-3725. Sobash, R. A. and D. J. Stensrud, 2013: The impact of covariance localization for radar data on enKF analyses of a developing MCS: Observing system simulation experiments. Mon. Wea. Rev., 141, 3691-3709. Kain, J. S. and Coauthors, 2013: A feasibility study for probabilistic convection initiation forecasts based on explicit numerical guidance, Bull. of Amer. Meteor. Soc., 94, 1213-1225. Clark, A. J., S. J. Weiss, I. L. Jirak, M. Coniglio, C. J. Melick, C. Siewert, R. A. Sobash, and Coauthors, 2012: An Overview of the 2010 Hazardous Weather Testbed Experimental Forecast Program Spring Experiment, Bull. of Amer. Meteor. Soc., 93, 55-74. Sobash, R. A., J. S. Kain, D. R. Bright, A. R. Dean, M. C. Coniglio, and S. J. Weiss, 2011: Probabilistic forecast guidance for severe thunderstorms based on the identification of extreme phenomena in convection-allowing model forecasts. Wea. and Forecasting, 26, 714-728. Kain, J. S., S. R. Dembek, S. J. Weiss, J. L. Case, J. J. Levit, and R. A. Sobash, 2010: Extracting Unique Information from High Resolution Forecast Models: Monitoring Selected Fields and Phenomena Every Time Step. Wea. and Forecasting, 25, 1536-1542. Laird, N., R. Sobash, and N. Hodas, 2010: Climatological Conditions of Lake-Effect Precipitation Events associated with the New York State Finger Lakes. J. Appl. Meteor. Climatol., 49, 1052-1062. Laird, N., R. Sobash, and N. Hodas, 2009: The Frequency and Characteristics of Lake-Effect Precipitation Events Associated with the New York State Finger Lakes. J. Appl. Meteor. Climatol., 48, 873-886.